Tokyo – November 17, 2017 – LINE announced today that LINE Pay (http://line.me/pay), a “smartphone wallet” service for the LINE Platform, has reached 10 million global transactions per month as of the end of October 2017. Along with that major milestone, LINE Pay has also achieved JPY 55 billion (approximately USD 482 million) worth of transactions monthly – or some JYP 300 billion cumulative from Jan. 1 to Nov. 2, 2017. LINE Pay has also reached 40 million global registered users, continuing its dramatic growth rate. Launched in Japan in December 2014, the service has expanded to more regions, reaching 10 million registered users worldwide as of February 2017. Growth has been particularly pronounced in Japan, Taiwan and Thailand. In Japan alone, LINE Pay has surpassed 30 million registered users and teamed up with 48 major banks, including Japan Post Bank Co., Ltd., The Bank of Tokyo-Mitsubishi UFJ, Ltd., and Sumitomo Mitsui Banking Corporation. Japanese users can charge money to their accounts in Lawson stores and at over 23,000 Seven Bank ATMs across Japan, as well as exchange money among 11 currencies. In Taiwan, LINE Pay is the No. 1 mobile payment service by several metrics, with 2.2 million registered users and 1 million CTBC & LINE Pay co-branded cards (the cards are issued in partnership with CTBC, one of the top banks in Taiwan) issued – unprecedented for the local market. According to the Taiwanese market research firm DataYogurt (https://datayogurt.tw/), LINE Pay is the No. 1 most used mobile payment service in Taiwan among all age groups, as well as the most used mobile payment on online shopping platforms. Major partners who have joined LINE Pay in Taiwan include department stores like Dream Mall, Global Mall, Hanshin Arena Shopping Plaza, Hanshin Department Store, Miramar Entertainment Park, Shinkong Mitsukoshi Department Store, Taipei 101 and UNI-USTYLE Department Store; hotel chains, including l’Hotel de Chine Group, Marriott and The Sherwood Taipei; all major convenience store chains, and retail shops like Watsons and Studio A. All told, LINE Pay has secured more than 20,000 affiliates and partners, with plans to continue its expansion. Furthermore, LINE Pay in Taiwan has been recognized for its work in corporate social responsibility. LINE Pay users can donate to 10 non-profit organizations. In the first half of 2017, the LINE Pay donation page in Taiwan raised over TWD 8 million (approximately USD 265,000) thanks to the generous support of local users. In Thailand, LINE Pay was reborn as Rabbit LINE Pay after partnering with BSS Holdings Co., Ltd., provider of Rabbit smart cards for mass transit systems and offline e-payments. In accordance with the country’s aim to evolve toward a cashless society, Rabbit LINE Pay tries to provide seamless convenience for payment solutions by partnering with a diverse range of online and offline affiliates, such as Kerry Express which is a leading delivery parcel company in Thailand, McDonald’s and local bank partners. LINE Pay complies with the Payment Card Industry Data Security Standard (PCI-DSS), a data security standard adopted by the global credit card industry and ISO/IEC27001. PCI-DSS ensures the information involving all credit card transactions is strictly preserved, managed and protected. 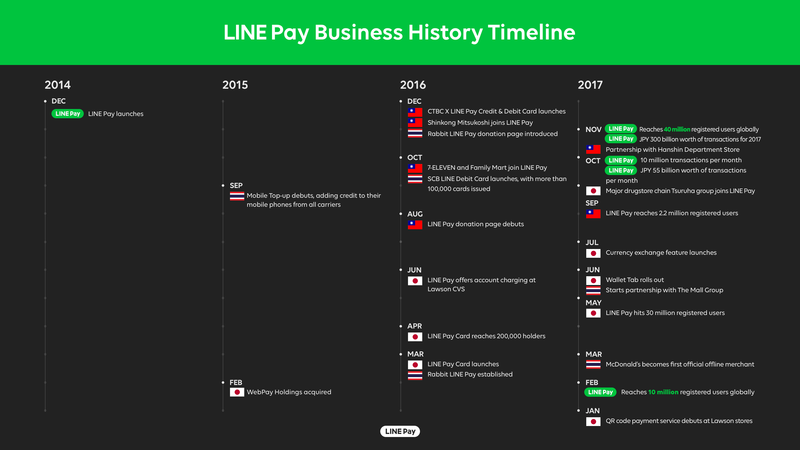 In addition, as LINE continues to develop and expand LINE Pay, the company is actively looking to hire more local talent in Japan, Korea, Taiwan and Thailand. “We are eager to find talented people who want to pioneer a dynamic challenge like the fast-growing field of mobile payments,” said CEO Ko. Detailed recruiting information is available at https://career.linecorp.com/linecorp/career/list.